As of 01.07.2017 Kunsthalle Krems has a second place of exhibition: Dominikanerkirche (Dominican Church). Please click on the red marks on the map below for journey details. Due to the construction of the Landesgalerie Niederösterreich (State Gallery of Lower Austria) there is restricted access and parking to the Kunstmeile Krems art institutions. Exhibitions will continue without restriction though. Steiner Landstraße is closed from the crossing of Doktor-Karl-Dorrek-Straße to the main house of Kunsthalle Krems: No thoroughfare! Karl-Eybl-Gasse is passable in both directions. Due to the construction site there is no parking at Franz-Zeller-Platz. 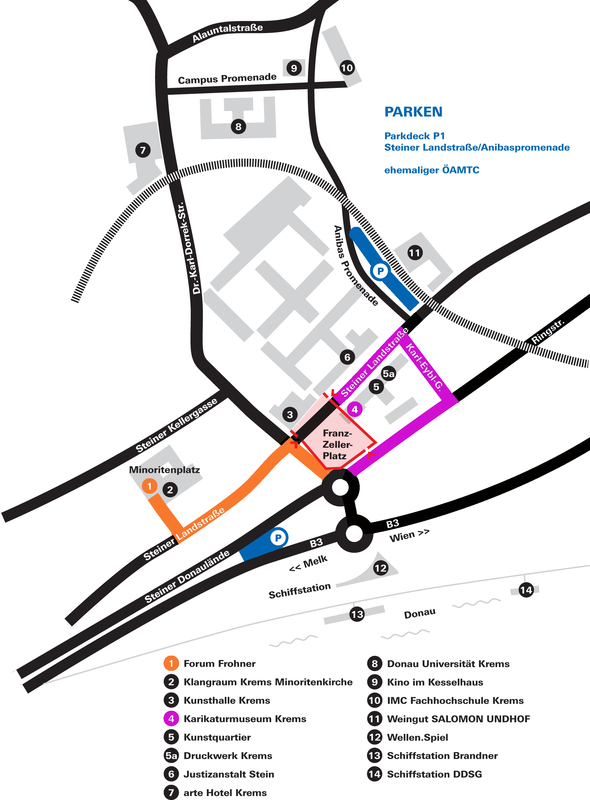 On weekends and public holidays you can use the parking garage "Parkdeck 1" next to the Justizanstalt (state prison). Telephone: +43 (0)2732 90 80 10 or Mail office@kunstmeile.at. Attention! Due to the construction of the Landesgalerie Niederösterreich there is restricted access to the Kunstmeile Krems art institutions. Exhibitions will continue without restriction though. Saturday, Sunday and public holidays 12 a.m. – 12 p.m. The local taxi company Fries can be reached any time at +43 (0) 664 421 033 55. The caricature museum is located opposite the boat station Krems/Stein. Why not combine a visit to us with a ride on the Danube through the Wachau region! Special offers are available for groups of 20 people or more.